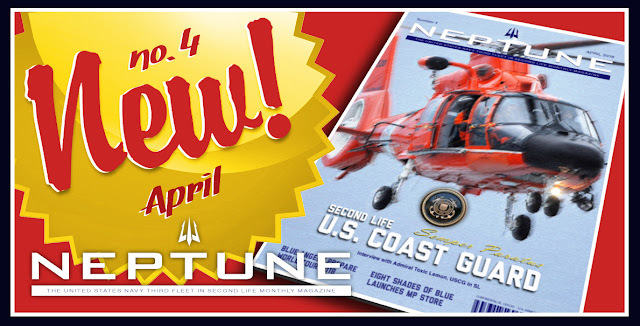 US Navy liveries available to all! The "Jolly Rogers" F/A-18D AG/200 POW MIA marks the release of :: 8SB :: U.S.N. paint jobs to the public. 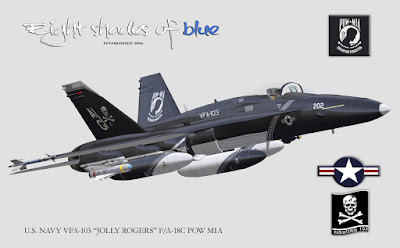 The "authorities" have decided to give the general public access to United States Navy liveries through our official supplier, Eight Shades of Blue ( :: 8SB :: ) that up to the release of Shana Carpool's new Hornet only supplied Second Life naval officers, in particular those serving in Third Fleet. This decision was already in the making as the Hornet was released with a VFA-25 set of liveries, hinting what was to come. However, the gift paint kit you get by purchasing Shana Carpool's Hornet, included in the aircraft box, remains special as it contains a REPLICA livery (see here). This was a one of a kind occasion - and this set is still available for 0 L$ in :: 8SB :: market place store and vendors across the grid. The opening salvo of this new release policy belongs to ALTERNATE SERIES VFA-103 "Jolly Rogers" C and D Hornets in a POW MIA color scheme, but other U.S. naval aircraft paint jobs will be available in the future, depending on :: 8SB :: listings and work load. SEE THE FIRST RELEASES FOLLOWING THE LINKS BELOW! Eight Shades of Blue will now create :: 8SB :: ALTERNATE SERIES United States Navy liveries for the market, available to all. The ALTERNATE SERIES are paint jobs inspired by real life aircraft that have served or still serve in air forces and navies across the globe. They are not replicas. U.S. Navy paint jobs related to Third Fleet squadrons, ALTERNATE or REPLICA, are never available to naval officers serving in other fleets than those mentioned below or to the public in general. 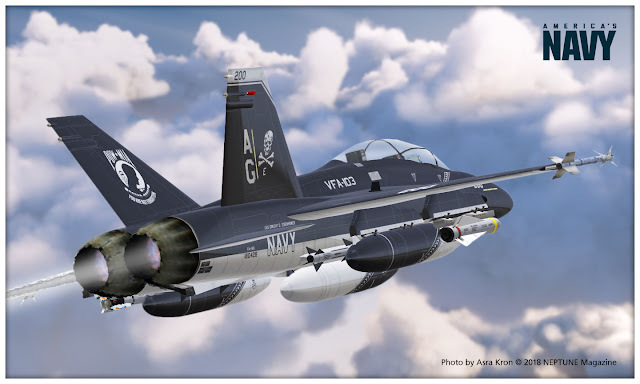 U.S. Navy aircraft replicas, in the :: 8SB :: REPLICA SERIES, are only available to naval officers serving in the Second Fleet, Third Fleet and Seventh Fleet in Second Life's United States Navy, with the caveat that Third Fleet, as the main procurer, has special prices. SL naval officers serving in the fleets mentioned also have access to SL active duty ALTERNATE liveries, Third Fleet ones remaining exclusive to the squadrons in the fleet. These are not accessible to all. We hope in this manner to further spread the image of the United States Navy throughout Second Life with quality liveries now available to all aviation enthusiasts - naval aviation in particular.